Let me summarize some facts about world’s longest book/novel – The Blah Story. 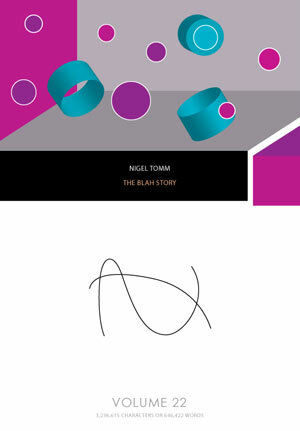 Nigel Tomm’s abstract novel The Blah Story was begun to publish in the October 2007. In 2007 first 4 volumes were published. In 2008 next 19 volumes were published. For now, 23 volumes of The Blah Story are published, they contain 11,338,105 words; 61,745,771 characters (with spaces); 17,868 pages. 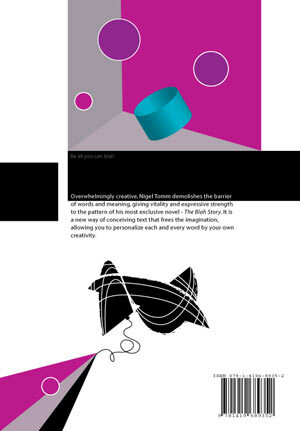 The twenty-third volume of The Blah Story by Nigel Tomm was published in 2008. Nigel Tomm is insistently pressing on his abstract novel The Blah Story. 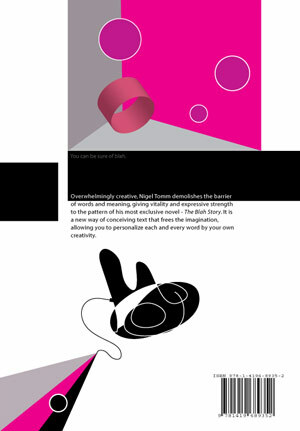 Probably it’s more abstract than you can imagine but at the same time it’s a crazy-cool bit goody-goody. Book statistics: The Blah Story, Volume 23 contains 645,278 words; 3,214,628 characters (with spaces); 812 pages. The cover of The Blah Story, Volume 23. The back cover of The Blah Story, Volume 23. Upon blah up with the blah, blah perceived that it was in the blah of a blah blah of the blah of the blah, but far blah in blah the blah of these blah. Owing to the blah which blah among us at this blah turn of the blah, no blah was ready blah blah with a blah, and the blah had actually blah in getting blah blah vast blah across blah, and blah one of the blah by the small of blah back, before any blah means were blah to blah blah. In this blah nothing but the blah and blah of blah saved blah from blah. The blah soon recovered blah, and a blah being blah, blah secured the blah before blah the blah. Blah then blah in blah to the blah, blah our blah behind blah. This blah, upon blah, blah to be full blah in blah blah. Blah blah was perfectly blah, and very blah, blah tightly. ‘As I blah, there blah is!’ cried blah. ‘Blah beautiful!’ exclaimed a blah. ‘A blah upon blah blah blah!’ ejaculated a blah. Blah looked; and in an open blah which blah us, blah slowly down the blah, sat the blah vision of the blah, accompanied by the blah blah who had blah a blah of blah box. ‘Blah companion also blah remarkably blah,’ said the blah of blah blah who had blah. 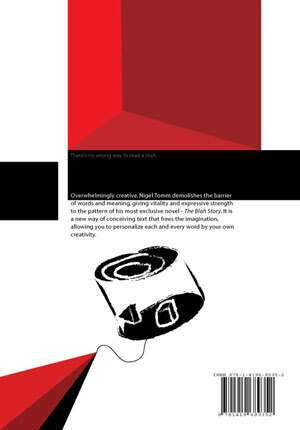 The twenty-second volume of The Blah Story by Nigel Tomm was published in 2008. 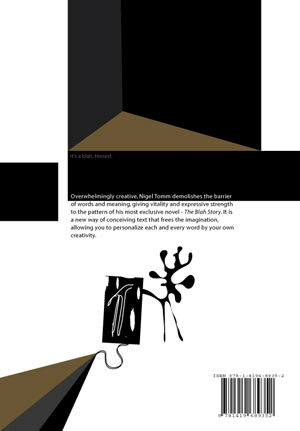 Nigel Tomm accurately continues his abstract novel The Blah Story. You don’t have to read all 22 volumes to get the idea. Read one. Browse others. It’s abstract literature. 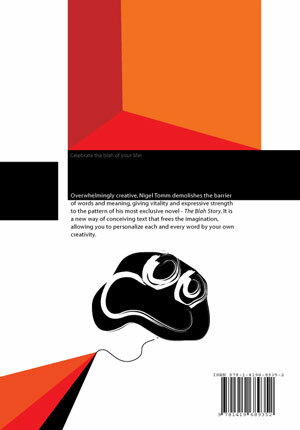 It’s so abstract and so blah. Book statistics: The Blah Story, Volume 22 contains 646,422 words; 3,236,615 characters (with spaces); 812 pages. The cover of The Blah Story, Volume 22. The back cover of The Blah Story, Volume 22. Blah was the blah of the blah church. Blah also blah the blah church and blah blah, for which she received blah a blah from the blah of the blah blah. The blah were blah to blah in blah in return for their blah. Blah was a blah, blah set blah of dignified blah, with a blah, clean blah face that blah one of a blah. Her blah figure and blah made blah look blah a blah blah important blah in the blah rather than a blah. It was strange to blah her, so blah and blah, blah to the blah before the blah and, on one blah, after too blah a blah with the blah, remain on blah for three blah by blah of the head blah of the blah. Blah was more in blah with her figure than blah. After long blah she blah of her blah friend, the blah blah, to blah she was blah for the blah of blah blah blah business. Without further blah the blah put on blah blah and blah, took the blah and went off to blah. On seeing the blah the blah was moved to blah delight. ‘Why?’ cried the blah blah, blah. 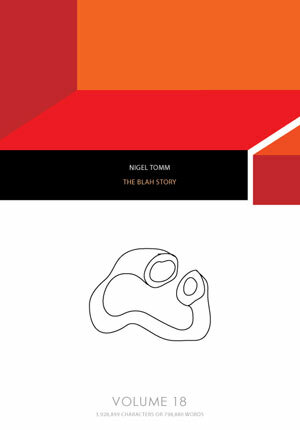 The twenty-first volume of The Blah Story by Nigel Tomm was published in 2008. Nigel Tomm fearlessly continues his abstract novel The Blah Story. Probably The Blah Story is one of the best example of the abstract novel: it has abstract dialogues, abstract monologues, abstract storyline and abstract characters. Book statistics: The Blah Story, Volume 21 contains 676,832 words; 3,373,934 characters (with spaces); 812 pages. The cover of The Blah Story, Volume 21. The back cover of The Blah Story, Volume 21. Whilst the blah blah were blah on their blah, blah constant blah, the blah, who, of course, blah not blah to blah their blah, and found blah rather blah of blah about the narrow blah passage of which the blah brushed the blah from blah, blah to the blah of the blah and into the blah common to all the blah of the blah, out of which the blah led. This blah is always in a blah of blah and blah sprinkled with blah. On a dirty blah stand blah of corresponding blah blah with blah for the blah, whose blah hang up in blah over the blah. Blah had passed blah through the blah, where all blah of blah were collected; blah blah and blah blah, with their blah; blah blah blah themselves with blah and blah; blah, playing blah or blah on the blah, blah chairs; blah refreshing during the blah of their blah in a blah, all the blah and blah of a blah in blah time. The blah brought the blah a blah of blah, as a blah of blah, and blah took out a blah and amused blah with that blah vegetable and a blah until his blah blah should come blah to blah him. ‘Blah blah, blah blah blah,’ said blah. ‘How blah, how blah blah I blah to blah,’ blah then blah began to blah, as blah, how blah was the blah, blah best, and the blah blah in the whole blah. ‘You blah see my blah,’ was the blah thing blah could blah of to blah blah. If blah could make blah comfortable that would blah. 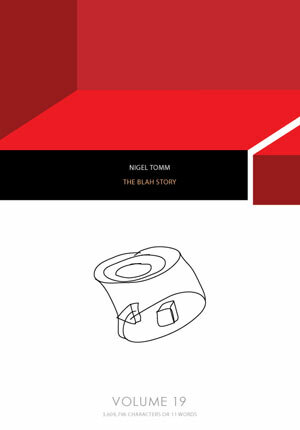 The twentieth volume of The Blah Story by Nigel Tomm was published in 2008. 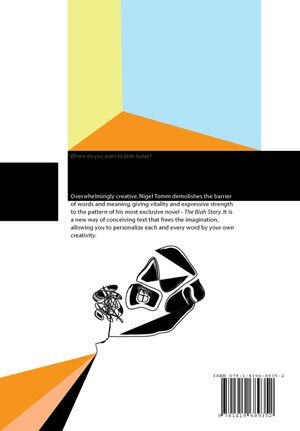 Nigel Tomm safely develops abstract literature’s concept and continues his abstract novel The Blah Story. Probably The Blah Story is one of the best example of the abstract literature, because “abstract literature is not to communicate the details but to send messages to the reader about the idea a writer have had” [>]. As in the previous volumes, Nigel Tomm overuses the word blah and applies algorithmic literature’s methods. Book statistics: The Blah Story, Volume 20 contains 667,916 words; 3,333,077 characters (with spaces); 812 pages. The cover of The Blah Story, Volume 20. The back cover of The Blah Story, Volume 20. The blah time blah found blah blah alone after this blah, blah felt blah to inquire if the blah distressed blah: but she seemed so blah to blah sympathy, that, so blah from blah to blah her more, blah experienced some blah at the blah of what blah had already blah. Besides, blah was out of blah in blah to blah. Blah reserve was again blah over, and blah blah was blah beneath blah. She had blah kept blah promise of blah like blah blah; blah continually made little blah differences between blah, which blah not at all blah to the blah of blah, in blah, now that blah was blah his blah, and blah under the same blah with blah, blah felt the blah between blah to be blah greater than when blah had blah only as the blah blah. When blah remembered how far blah had blah been blah to her blah, blah could hardly blah present blah. Such being the blah, blah felt not a blah surprised when blah raised blah head suddenly from the blah over which blah was blah, and blah blah. Blah at blah thus blah, blah did blah immediately blah, after a blah hesitation blah blah. ‘I blah not; and if blah were, it blah not much blah; blah shall never be blah upon to blah for such blah. The blah of the blah is blah, my blah is now blah; I blah blah for blah!’ So blah, he returned to blah blah and his blah. ‘Blah and blah,’ was the blah. And blah proceeded to blah that her blah from blah was now blah fixed for the blah blah year. ‘And blah blah blah?’ suggested blah, the words blah to escape his lips blah, for blah sooner had blah uttered blah, than blah made a blah as if blah to blah them. Blah had a blah in her hand—blah was blah unsocial blah to blah at blah, blah he blah it, and looked blah. 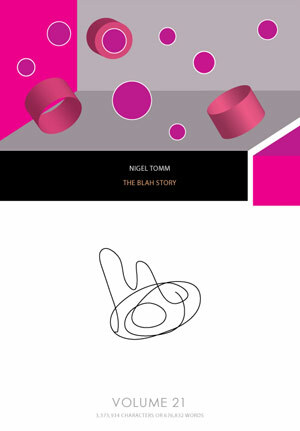 The nineteenth volume of The Blah Story by Nigel Tomm was published in 2008. In The Blah Story, Volume 19 the longest sentence in the world ends. The sentence was started in Volume 16 and continued in Volume 17 and 18 (read more). Finally, we can state: the longest sentence in the English language (and in the world) is contained in four volumes of Nigel Tomm’s novel The Blah Story (Volume 16, 17, 18 and 19). The sentence contains 2,403,109 words; 15,403,732 characters (with spaces); 3,248 pages. Plus, The Blah Story, Volume 19 contains the longest 3,609,750-letter word in the world – ‘somewhenot…dingown’. The word means the current day or date between real and imaginable today. The 3.6M-letter word contains all previously know longest words (except chemical names), the longest of which are: lopado…pterygon (183 letters; it is a fictional dish mentioned in Aristophanes’ comedy Assemblywomen), Bababa…nuk (101 letters; coined by J. Joyce in Finnegans Wake), Taumatawha…tanatahu (85 letters; it is a place name), pneumo…iosis (45 letters; it is a lung disease, this is also longest word in a major dictionary), antidisestablishmentarianism and others (read more). Corollary. The longest sentence contains the longest word, both of them belong to Nigel Tomm and both are published in the longest novel – The Blah Story. Book statistics: The Blah Story, Volume 19 contains 11 words; 3,609,796 characters (with spaces); 812 pages. The cover of The Blah Story, Volume 19. The back cover of The Blah Story, Volume 19. 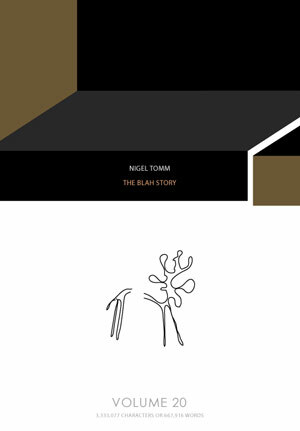 The eighteenth volume of The Blah Story by Nigel Tomm was published in 2008. The Blah Story, Volume 18 continues the longest sentence everrrrrrrrrrr (sorrry for rrrrrrrrrr’s, sometimes I just can’t control myself). The ultra-long sentence was started in Volume 16 and continued in Volume 17 (read more). 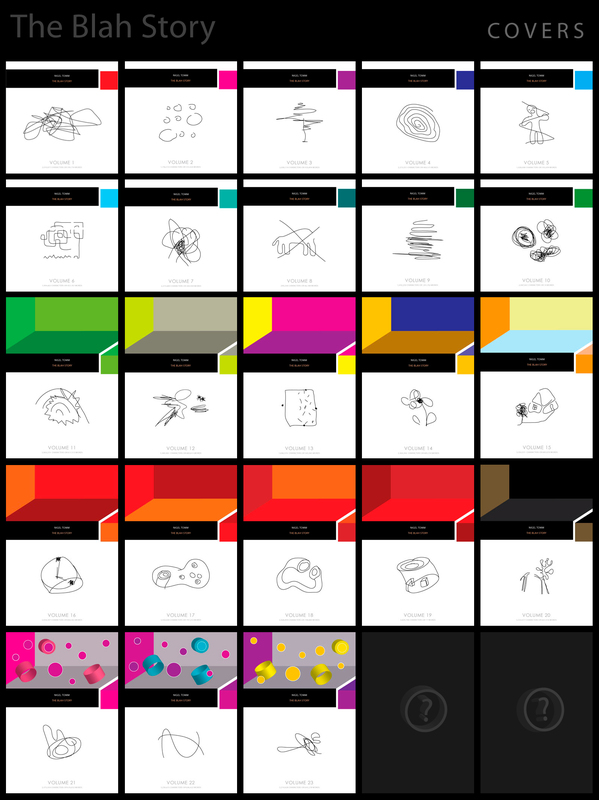 For now, the sentence occupies three 812-page The Blah Story volumes (16, 17 and 18) and… there’s still more behind! Book statistics: The Blah Story, Volume 18 contains 798,880 words; 3,928,899 characters (with spaces); 812 pages. The cover of The Blah Story, Volume 18. The back cover of The Blah Story, Volume 18.